When we think of hip hop jewelry, extravagant chains, grills, four-finger rings and oversized hoop earrings made of gold, platinum and diamonds all come to mind. Early on, flashy jewelry became an integral part of hip hop culture and still serves as a symbol of a rapper’s wealth, prestige and success. While the basis of hip hop jewelry remains unchanged, the various styles have shifted over time. Hip hop jewelry first emerged in the 1970s when DJ Kool Herc introduced hip hop. By the early 80s, hip hop had transitioned from an underground music scene to mainstream when hip hop groups and MCs came onto the scene. Groundbreaking hip hop legend Kurtis Blow popularized wearing multiple chains at one time with oversized medallions, whereas Run DMC introduced the trend of wearing chucky dookie chains over track suits. These styles replaced the skinny rope chains of the DJ Kool Herc era. As large chains became the norm for successful male rappers, oversized hoop earrings were commonly worn by women in the rap game, including Roxanne Shanté and Salt-N-Pepa. Traditional rings were also transformed into the elaborate four-finger ring. The classic gold tooth cap that was made popular early on was later replaced by full mouthfuls of gold grills. These hip hop jewelry styles were popularized by rap icons Slick Rick and Big Daddy Kane. When hip hop first burst onto the scene, gold was the standard material and color used in hip hop jewelry. This changed in the 1990s when rap artists like Jay-Z, P. Diddy (Puffy Daddy at the time), Juvenile and The Hot Boys switched out the former fads for more luxurious stylings. Hip hop jewelry in the 90s was comprised of platinum and encrusted in diamonds, and when it came to diamonds, the more, the better. Like with chains, diamonds became all the rage for grills too. 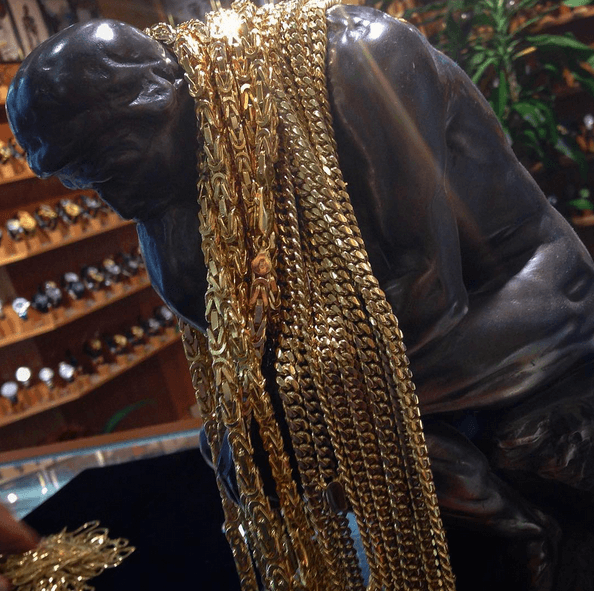 In 1998 the Cash Money Millionaires coined the famous term “bling bling” to describe the showy, over-the-top style of hip hop jewelry – a term that’s still used today. Nowadays, hip hop jewlery has grown to include large pendants and belt buckles, iced-out watches and chains, and diamond stud earrings. Today’s hip hop jewelry trends have transitioned from the chucky rope chains of the early years to brighter accessories iced out in diamonds. As in the past, bling bling remains a way for rappers to show that they’ve made it and become successful. The African American community has endured a long history of slavery and oppression, and much of that discrimination still exists today. 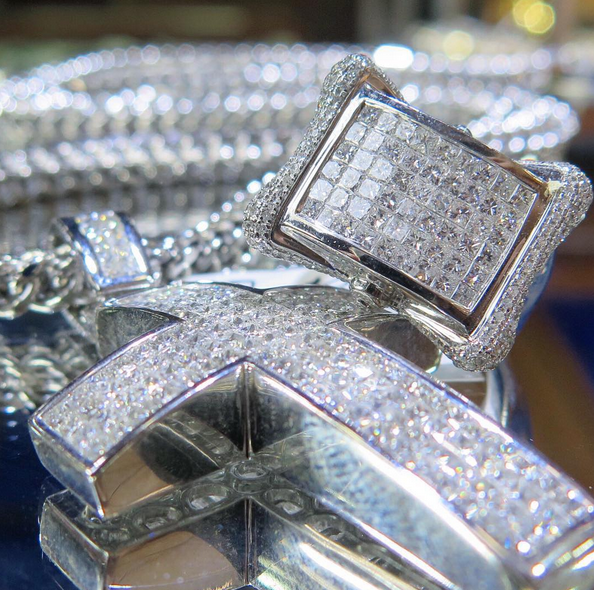 Flashy, expensive jewlery has been way for rappers to announce their presence, success and accomplishments. Today there are a lot of hip hop jewelry stores that provide the latest trends in hip hop. At TraxNYC, we provide a large assortment of custom diamond and gold jewelry that’s prized for its quality, style and craftsmanship. Visit us online to browse our styles that are adorned by rappers and their fans today.